AS A HAIRDRESSER, I BELIEVE THE MOST IMPORTANT PART OF MY JOB IS TO RESPECT THE HEALTH AND INTEGRITY OF THE HAIR. EVERY INDIVIDUAL’S HAIR IS STRUCTURALLY SIMILAR, BUT HAS VERY DIFFERENT NEEDS. POROSITY, TEXTURE, DENSITY, AND PREVIOUS CHEMICAL SERVICES CAN BE LIMITING FACTORS FOR COLOR SERVICES. ANYTIME A COLOR OR CHEMICAL SERVICE IS APPLIED TO THE HAIR, THE BONDS IN THE HAIR ARE SUBJECT TO CHANGE. FREQUENT COLOR APPLICATIONS COMBINED WITH THERMAL STYLING SENSITIZE THE HAIR AND CREATE DAMAGE DEEP IN THE CUTICLE. WITH HAIR TRENDS PUSHING THE ENVELOPE AND MORE GUESTS LOOKING FOR SAFER ALTERNATIVES TO ACHIEVE THEIR HAIR GOALS, OLAPLEX IS BECOMING A LEADING NAME IN THE SALON INDUSTRY AND AN EVERYDAY PART OF MY GUEST’S SERVICE EXPERIENCE. OLAPLEX USES A TWO STEP IN-SALON PROCESS THAT WORKS ON A MOLECULAR LEVEL TO SEEK OUT BROKEN DISULFIDE BONDS IN THE HAIR THAT ARE CAUSED BY CHEMICAL, THERMAL, AND MECHANICAL DAMAGE. OLAPLEX IS ABLE TO SEEK OUT SINGLE, SULFUR HYDROGEN BONDS IN THE HAIR AND CROSS LINK THEM BACK TOGETHER TO FORM DISULFIDE BONDS. THESE DISULFIDE BONDS ARE WHAT GIVE THE HAIR STRENGTH AND SHINE, AND WITHOUT THEM THE HAIR’S INTEGRITY CAN BE COMPROMISED. 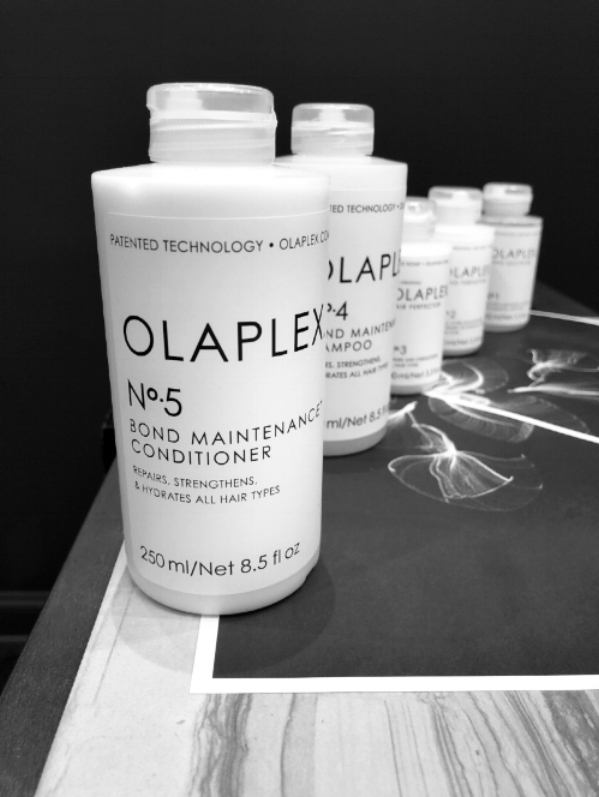 OLAPLEX CAN BE USED ON ITS OWN AS A SERVICE TO RESTORE COMPROMISED HAIR, OR IT CAN BE ADDED TO YOUR COLOR OR LIGHTENER TO PROVIDE ULTIMATE BREAKAGE ASSURANCE. OLAPLEX HAS BECOME THE MOST IMPORTANT TOOL IN MY ARSENAL TO PROVIDE GUESTS WITH OPTIMUM CONDITIONING DURING THEIR CHEMICAL SERVICES. OLAPLEX GIVES ME INSURANCE THAT MY QUESTS’ HAIR WILL BE CARED FOR FROM START TO FINISH DURING THE COLORING PROCESS. IN THE PAST, IF A GUEST SAT DOWN IN THE CHAIR AND THEIR HAIR WAS COMPROMISED, THERE WERE NO SOLUTIONS FOR THE GUEST OTHER THAN DEEP CONDITIONING TREATMENTS. NOW, THERE IS AN OPTION FOR EVERY GUEST, EVERY TIME. IF SOMEONE IS NOT ABLE TO RECEIVE A SERVICE NOW BECAUSE PREVIOUS DAMAGE HAS MADE IT IMPOSSIBLE, THEY CAN USE THE OLAPLEX SHAMPOO, CONDITIONER AND #3 AT HOME UNTIL THEIR HAIR’S INTEGRITY HAS BEEN REPAIRED. IN TIME, OLAPLEX PROTECTS HAIR, PREVENTS FURTHER DAMAGE, AND MAKES HAIR STRONGER, HEALTHIER AND SHINIER. I AM NOW ABLE TO TRULY PROVIDE MY GUESTS WITH A TIMELINE FOR ACHIEVING THEIR HAIR GOALS. OLAPLEX HAS CHANGED THE WORLD OF HAIR, AND HAS MADE OUR POSSIBILITIES AS HAIRDRESSERS LIMITLESS. I AM TRULY EXCITED ABOUT THE TRANSFORMATIONS I HAVE SEEN IN MY GUEST’S HAIR. MORE IMPORTANTLY, GUESTS WHO HAVE BEEN USING OLAPLEX HAVE BEEN ABLE TO GROW THEIR HAIR LONGER AND STRONGER THAN EVER BEFORE, AND FOR ME THAT IS PRICELESS.